Call it a luxury, but the ThinkPad 8 is the first work-ready, 8-inch Windows 8.1 tablet. 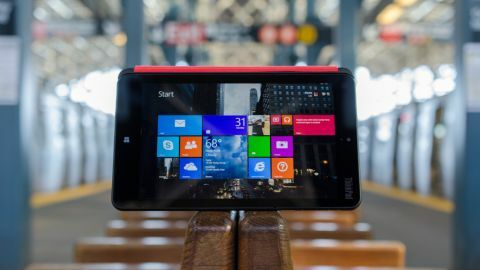 The range of 8-inch tablets featuring full-fat Windows 8.1 is growing everyday. While there have been a few great slates filling out this micro-slab space, it's also grown stale. As of late, most devices sport an uninspiring 1200 x 800 resolution screen and nearly the same internals. Now, Lenovo hopes to get out of the rut with the ThinkPad 8, the first 8-inch Windows tablet with a 1920 x 1200 resolution touch panel and punchier Intel Atom processor to boot. The ThinkPad 8 has some promising specs on paper, but does this tablet truly usher in the next generation of small Windows 8.1 slates? With its latest tablet, Lenovo aimed to deliver a device that looks and feels premium, and it shows. The ThinkPad 8 is backed with a machined aluminium shell, rather than the plasticky Dell Venue 8 Pro and faux-metal Acer Iconia W4. This solid piece of metal – which spans across the entire back – is quite reminiscent of the iPad Mini 2 with Retina display and iPad Air, down to the anodized finish. Though, the Lenovo received an extra coat of black paint. A soft, rubbery material wraps the ThinkPad 8's slim edges and it helps to keep a grip on the device. Along the right edge is the power button, volume rocker, and USB 3.0 port, which connects to Lenovo's USB 3.0 dock. And don't worry about bringing the included cable everywhere: a micro USB cable also fits in the port for charging. The left side, meanwhile, holds a micro HDMI port plus an additional flap hiding a microSD slot underneath. In another nod to the iPad, the tablet's left side side also houses hidden magnets for attaching the optional, $34.99 (about £20, AU$37) Quickshot Cover. The accessory does not mimic Apple's folding stand design. Rather, there is a small flap that, when flipped back, reveals the rear lens and automatically launches the Windows camera app. Normally I don't shoot photos with a tablet, but the ThinkPad 8 is equipped with a rear camera that's a step up from the iPads of the world. The 8MP sensor at the heart of this shooter can resolve some high-resolution images. However, image noise easily enters the frame unless photos are taken in bright, fully lit conditions. Even in a bit of shade, stills are full of nasty bits of green and red digital noise. More impressive than the lens itself is Windows 8.1's built-in image editor. Without having to dive into Photoshop or Skitch, I could level out an overblown exposure, warm up a dull image caught on a rainy day, and even do a few fun tricks like this toy box image above. But before you go shooting your first photo, know that the camera app is prone to crash the entire device. The first few times I used the Quickshot Cover to turn on the camera, it sent the tablet into a panic that required a system reset. Other times, the tablet would simply display an unresponsive black screen, leaving me with no choice but turn it off completely. It was a frustrating experience, especially for missing those decisive, photographic moments. That said, this is a known issue that can be somewhat remedied with a quick update downloaded through the baked-in Lenovo Solutions app. Even with the update in place, though, the camera is still quite buggy. After updating, I triggered the camera only to have it loop back to a low-resolution version of the Windows Start Screen, with no way to access the desktop or any apps. A restart cycle later – plus fiddling around with the display resolution settings – and the tablet returned to normal. This is honestly the strangest issue I've ever experienced with any device before.